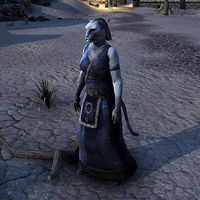 Hatiha is a Khajiit found at her camp located just outside the city of Bergama. She often wanders between her camp and the gates to Bergama. She is also the author of the book Lizards. "When you hunt lizards on the sands, you must know their favorite basking spots. I make sure the softest and warmest pits are clear of debris. Then, the lizards come to me." This page was last modified on 7 July 2018, at 19:23.